This quiz was evening entertainment at the 2018 ICA Mountain Cartography Workshop, Hvar, Croatia. The best team (there were four people on each team representing a mix of countries) scored 17.25 out of 22 possible points. Can you beat the mountain experts? Give yourself one point for each correct answer—your spelling need not be perfect. Answers are at the end. 1) What is the highest national capital in the world? 2) What is the term for the lowest-altitude area of a glacier with a net annual loss in ice mass due to melting, sublimation, evaporation, ice calving, and avalanches? 3) Lomonosov Ridge is an undersea mountain range named after Mikhail Lomonosov, an 18th century Russian geographer and polymath. In which ocean is it located? 4) The sport of B.A.S.E. jumping attracts thrill-seekers who leap from high places. What does the acronym B.A.S.E. stand for? (0.25 point for each correct word). 5) If a climber of Mt. Everest mentions the term “Hillary Step,” what are they referring to? An oxygen conserving technique when climbing above 8,000m. A steep ledge near the top that requires technical climbing. The exhilarating last step taken when you finally reach the summit. 6) This North American mountain range was named after an obscure Florida Indian tribe. It was not formally named until the late 1800s. What mountain range is it? 7) This retailer of mountaineering and trekking equipment headquartered in Seon, Switzerland, features an extinct animal on its logo. Name the company. 8) There are four African countries with ski resorts. Which one has the most? 10) Swiss cartographer Eduard Imhof participated in a 1930 expedition to measure the height of a Chinese peak then thought to be higher than Everest. It turned out to be much lower, only 7,556m. What is the name of this peak? 11) Hvar has a Mediterranean climate similar to that of Los Angeles, California, and Perth, Australia. What is the Köppen climate classification of these places? Provide the three letters. 12) K2, the world's second-highest peak, has a name that derives from a notation used by the Great Trigonometric Survey of British India. What does the “K” in K2 stand for? 13) What is the Italian name for the system of cables, ladders, and carved footholds used to make mountaineering routes safer and easier for novice climbers? 14) What central Asian mountain range whose name means “heavenly” is home to endangered snow leopards? 15) About 850 distinct languages are spoken in and around this highland region, which has the greatest linguistic diversity of anywhere on Earth. Where is it? 16) What were Edmund Hillary’s famous first words to his waiting team at base camp after successfully climbing Mount Everest with Tenzing Norgay? Hint: what he said was probably not printed in 1953. 17) Identify the mountain range indicated on the map below. 18) In the movie Avatar, 3D animators using Vue software created the Hallelujah Mountains on the fictional planet of Pandora. What amazing characteristic made the Hallelujah Mountains different from any mountains on Earth? 19) Which of these peninsulas has the highest mountain? 20) Name the famous holy mountain near the headwaters of the Indus and Ganges rivers circumambulated by Hindu, Buddhist, and Jain pilgrims. What is the name and elevation of the highest peak on Hvar Island? 1)xxLa Paz, Bolivia, is the highest capital at 3,630 meters. 2)xxZone of ablation is the part of a glacier with a net annual loss of ice mass. 3)xxLomonsov Ridge is in the Arctic Ocean. 4)xxB = Building. A = Antenna. S = Span. E = Earth. 5)xxHillary Step is a steep ledge near the top of Mount Everest. 6)xxThe Appalachian Mountains were named after a Florida Indian tribe. 7)xxMammut (English: mammoth) is the Seon, Switzerland, company. 8)xxMorocco 3 has ski areas, Algeria 2, South Africa 1, and Lesotho 1. 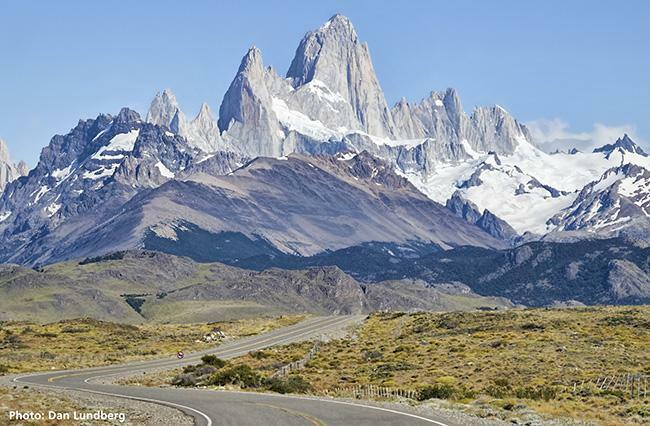 9)xxMonte Fitz Roy, Patagonia, is the mountain in the photo. 10)xxEduard Imhof went to Minya Konka, aka Mount Gongga or Gongga Shan. 11)xxCsa is the three-letter Köppen climate classification for Hvar. 12)xxKarakorum. K2 is in the Karakorum Range. 13)xxVia ferrata or “iron path” is the Italian word for mountaineering aids. 14)xxTian Shan are the "heavenly" Central Asian mountains where snow xxxxxleopards are still found. 15)xxThe New Guinea highlands (and surroundings) are where 850 languages xxxxxare spoken. 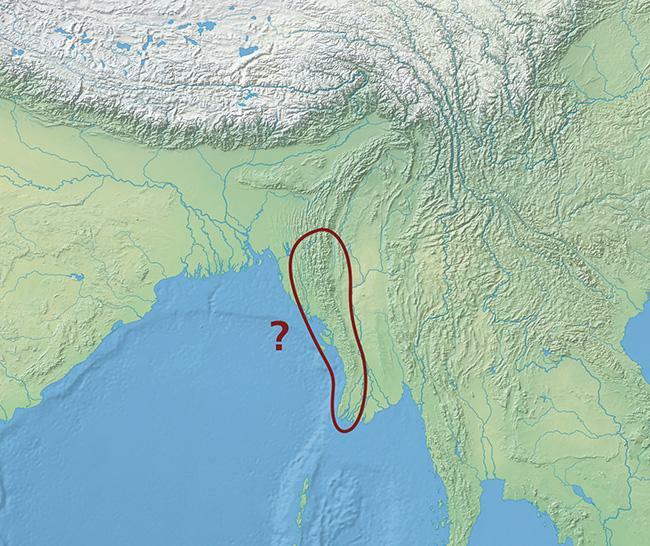 17)xxThe mountains on the map, which are in Burma, are called either the xxxxxArakan Yoma or Rakhine Range. 18)xxThe Halejuah Mountains on planet Pandora floated in the atmosphere. 19)xxThe Arabian Peninsula, 3,666m, is highest. 20)xxMt. Kailash, Tibet, is circimambulated by religeous pilgrims. Extra credit: Sveta Nikola, 628m, is the highest peak on Hvar Island. The team of Laura Gerrish, Brooke Marston,   Alex Tait, and Dragan Tasić won the 2018 Mountain Trivia Challenge with a score of 17.25 points. Want more mountain trivia? Check out the 2016 quiz here.